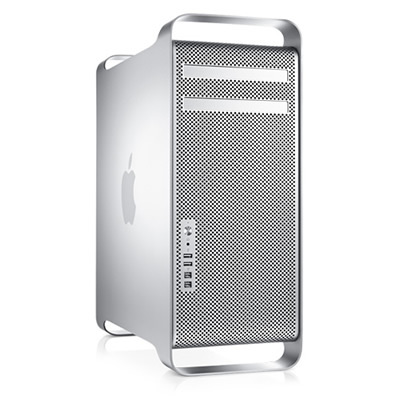 This Mac Pro Mid-2012 features a 3.33 GHz 6 Core 32-nm Intel Xeon Westmere processor with 12 MB L3 cache. It has Turbo Boost dynamic performance up to 3.6GHz and Hyper Threading technology for up to 12 virtual cores. It includes 32GB of 1333 MHz DDR3 PC3-10600 ECC Apple OEM memory, a 1 TB 7200 RPM, Serial ATA hard drive, an 18X dual-layer SuperDrive and an ATI Radeon HD 5870 graphics card with 1 GB of GDDR5 memory that can support up to three Apple 30 inch displays at a resolution of 2560x1600. Expansion includes one free optical drive bay, three free hard drive slots, and three free PCIe 2.0 slots with support for 16 lane cards, one free PCIe 2.0 x16 slot and two free PCIe 2.0 x4 slots. Connections include five USB 2.0 ports, four Firewire 800 ports, TOSLINK optical digital audio input and output, analog stereo line-level input and output minijacks, a front-panel headphone minijack. a dual-link DVI port and two Mini DisplayPorts that are capable of passing a multichannel audio signal. Communications include built-in AirPort Extreme 802.11n Wi-Fi (802.11a/b/g compatible), Bluetooth 2.1 + Enhanced Data Rate (EDR) wireless technology and two independent 10/100/1000BASE-T Gigabit Ethernet ports. The Mac Pro Mid-2012 models were released on June 11th 2012, and discontinued on October 22nd 2013. Dimensions: Height 20.1, Width 8.1, Depth 18.7 inches. Weight: 40lbs. This used Mac Pro Mid-2012 has the original OEM configuration, is in perfect working order and great condition with some minor marks on the outer case from previous use. It comes with your choice of OS X installed and power-cord. If you have questions please Contact Us, or for general info see the Help page.